If my dad had really loved me, he would have built me one of these. Boy Won’t Need Dad’s Car Now! 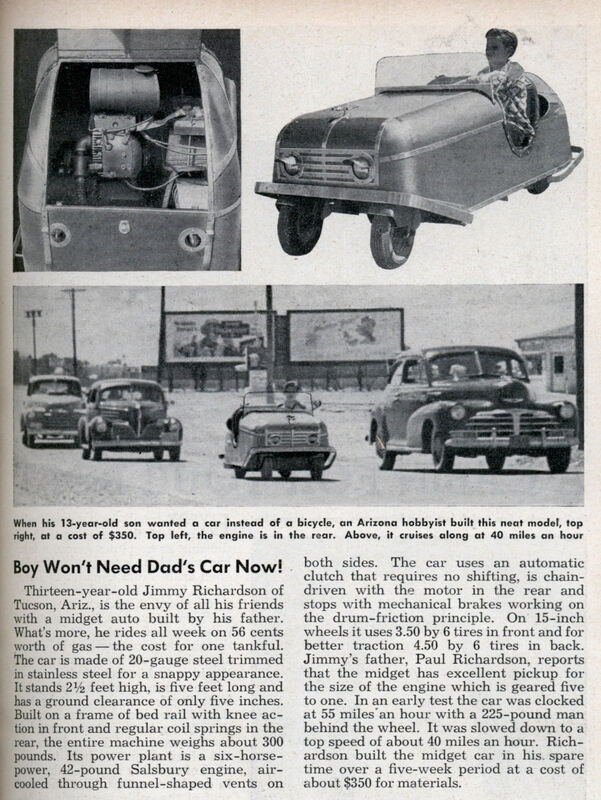 Thirteen-year-old Jimmy Richardson of Tucson, Ariz., is the envy of all his friends with a midget auto built by his father. What’s more, he rides all week on 56 cents worth of gas â€” the cost for one tankful. The car is made of 20-gauge steel trimmed in stainless steel for a snappy appearance. It stands 2-1/2 feet high, is five feet long and has a ground clearance of only five inches. Built on a frame of bed rail with knee action in front and regular coil springs in the rear, the entire machine weighs about 300 pounds. Its power plant is a six-horsepower, 42-pound Salsbury engine, air-cooled through funnel-shaped vents on both sides. The car uses an automatic clutch that requires no shifting, is chain-driven with the motor in the rear and stops with mechanical brakes working on the drum-friction principle. On 15-inch wheels it uses 3.50 by 6 tires in front and for better traction 4.50 by 6 tires in back. Jimmy’s father, Paul Richardson, reports that the midget has excellent pickup for the size of the engine which is geared five to one. In an early test the car was clocked at 55 miles’an hour with a 225-pound man behind the wheel. It was slowed down to a top speed of about 40 miles an hour. 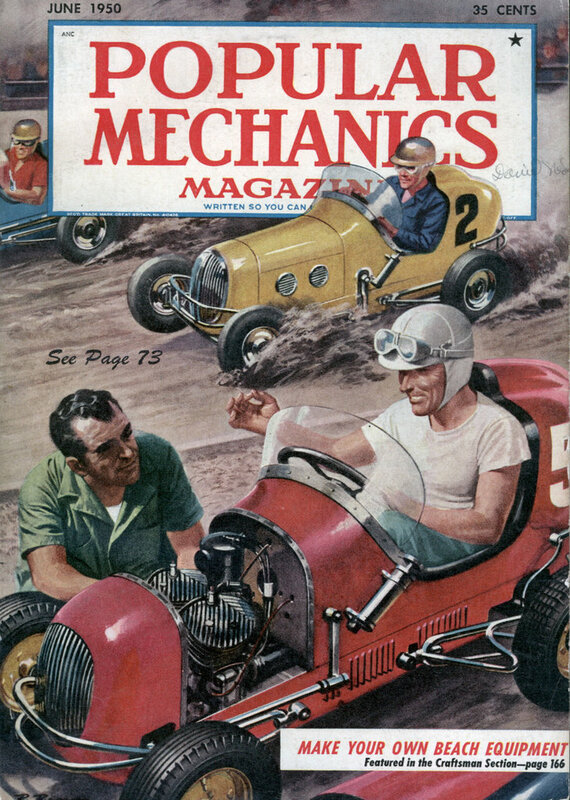 Richardson built the midget car in his. spare time over a five-week period at a cost of about $350 for materials. I can’t imagine doing 40, much less 55 mph on something with that narrow a stance (it looks like about 22-24 inches). If the 225lb guy tilted his head a couple of degrees to one side he’d probably roll the thing like a Ford Sport Trac SUV. Just a cute little thing worth subscribing to, if you’re tickled by old newspaper clippings.